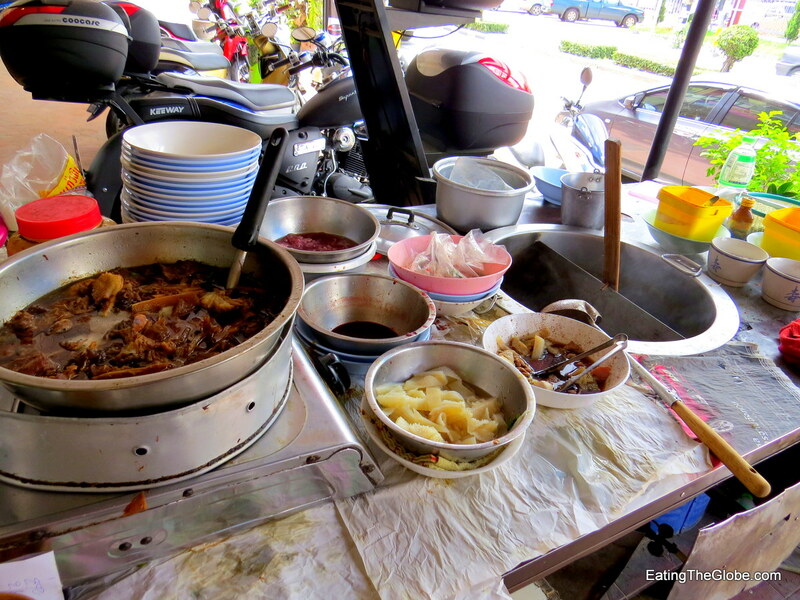 Kuay Tiew Reur Rang Sit Go-Heng serves both pork and beef boat noodle soup. I tried the pork, and was in complete heaven. 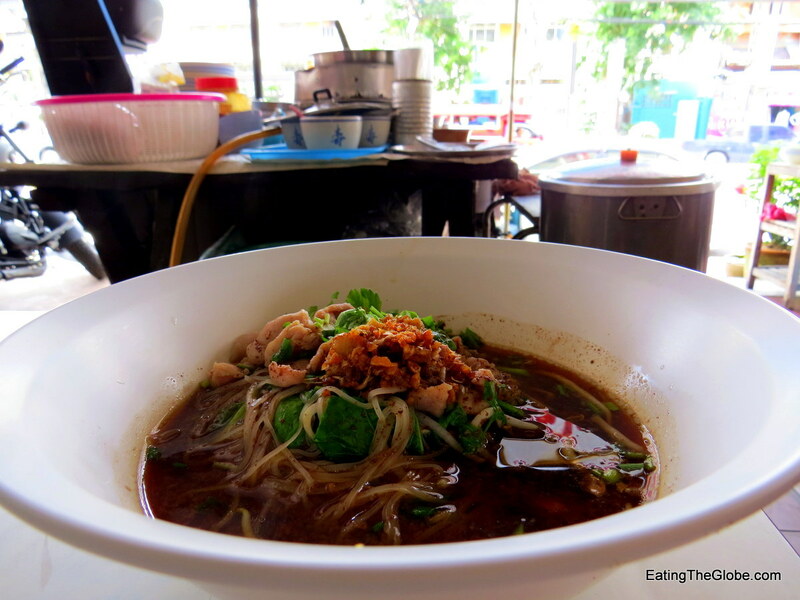 Boat noodle soup originated around the old floating markets of Ayutthaya which is where i gets its name. 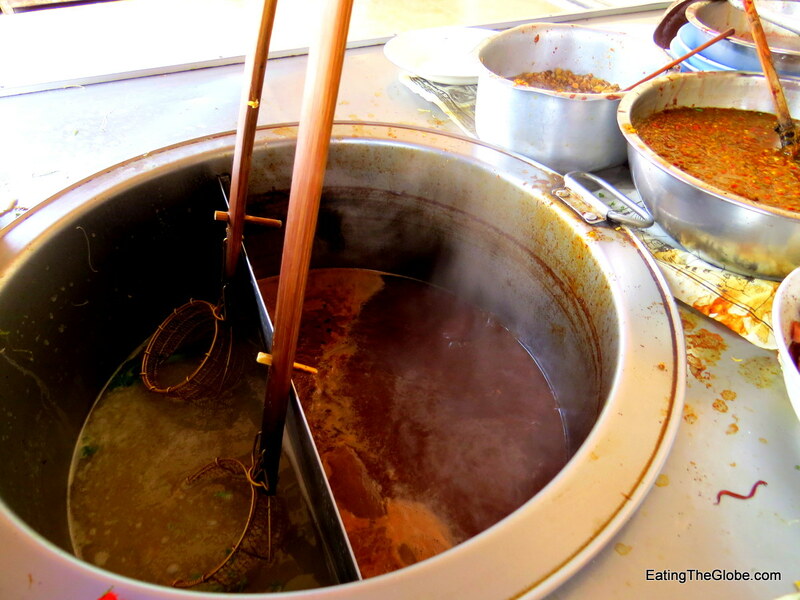 The secret to boat noodle soup lies in the pork blood used to make it. Before you get all squeamish on me, don’t worry, you won’t even know there’s blood in the soup. All that you will know is that you are eating one of the richest, most flavorful soups you’ve ever had. 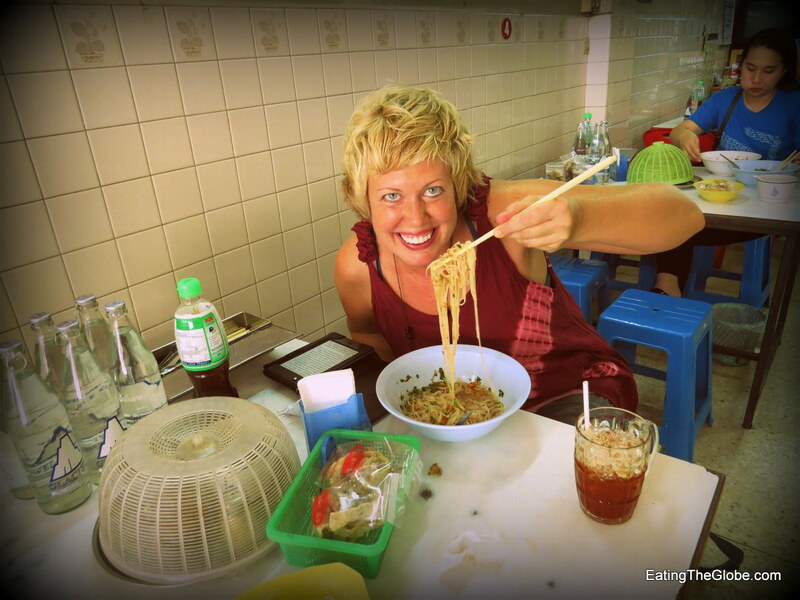 I discovered Kuay Tiew Reur Rang Sit Go-Heng In Chiang Mai by doing what I usually do in Thailand. I tend to go to random Thai restaurants or street stalls and if there are no pictures of the food or a menu, I just say, “one, please”, and eat whatever I’m served. My reward is that I usually find some of the best food of my life by dining this way. My punishment is that I’m usually subjected to having my picture taken by every local in the restaurant and being stared at for the duration of my meal. It’s like I am the only non-Thai person to have ever set foot into some of these places. Here, I was asked “beef or pork?”, so I said pork, not knowing exactly what I would be getting. To my delight, they were serving some of the best boat noodle soup I’ve had yet. 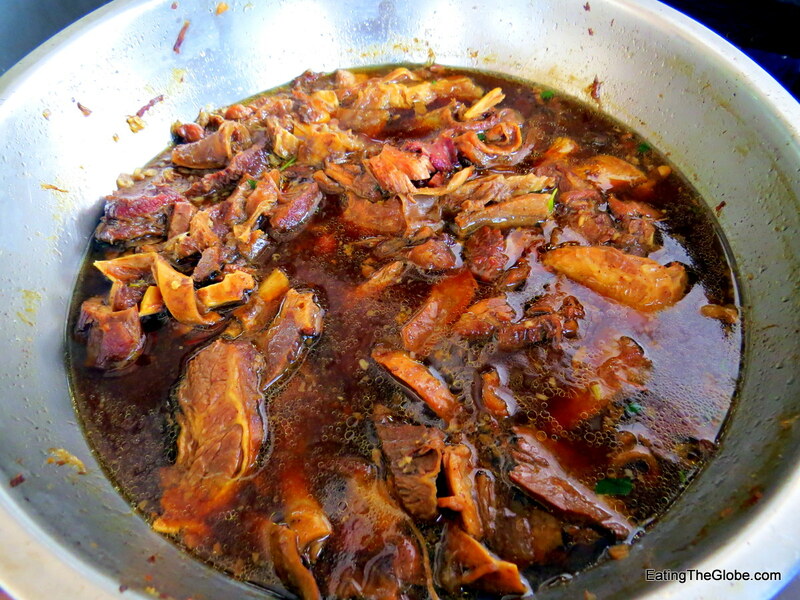 The amber-colored broth was incredibly rich and flavorful. The pork was perfectly tender. The morning glory and cilantro were the perfect accents to brighten the soup’s flavor. The soup was the perfect balance between savory and spicy, sour and sweet. But, the crowning glory of it was the pork cracklings they served on top. Oh yes! Eat this soup, and you, too, can feel like Bourdain for 15 seconds. It was so perfectly good. I was so excited about the boat noodle soup, that it was at this point that the owners daughter revealed to me that they also served Pork Tom Yum soup, so I went back the next day to try that one. 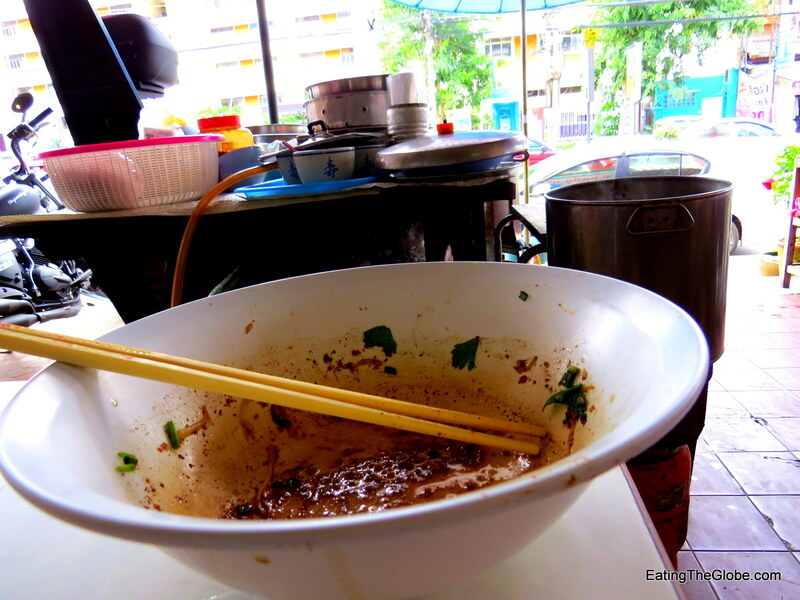 It was also very good and much more spicy, but it lacked the deep flavor of the boat noodle soup. Also, don’t miss the iced cha manao or Thai tea with lime. It’s one of the most refreshing things on earth! 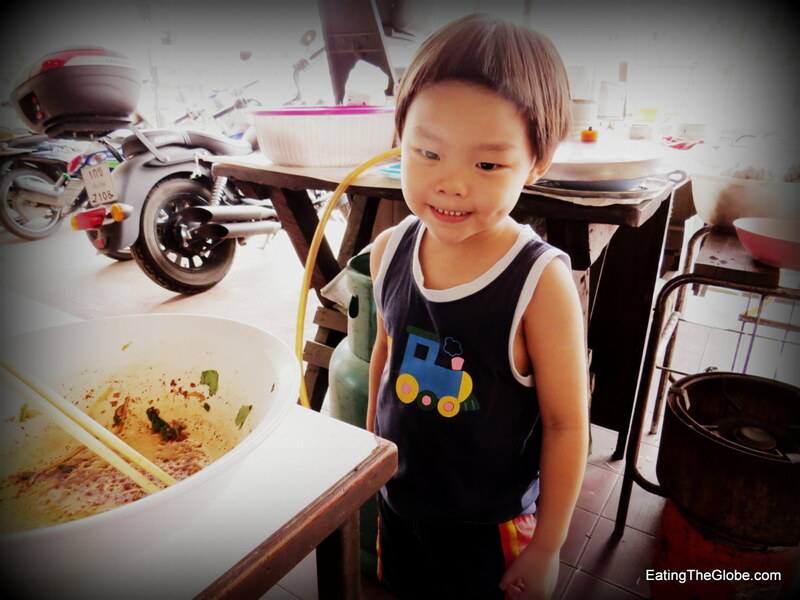 Kuay Tiew Reur Rang Sit Go-Heng, like most Thai restaurants is run by an entire family. 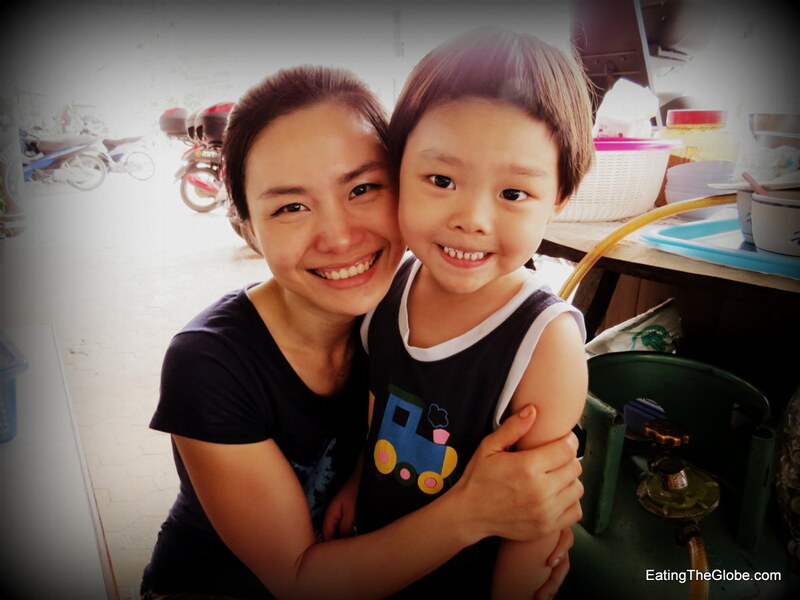 I met the owner’s daughter and her son. He loved having his picture taken by me. 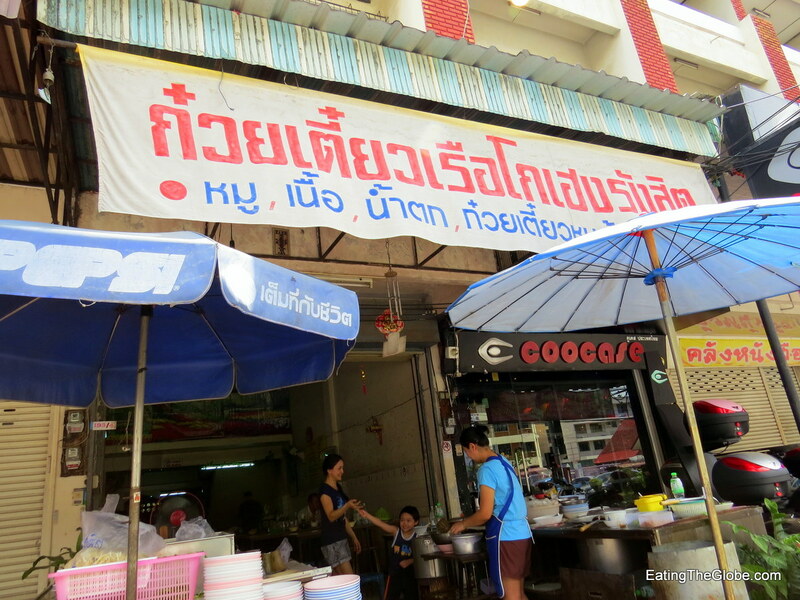 Price– One bowl of soup with a cha manao costs 50 baht or about $1.50 USD. 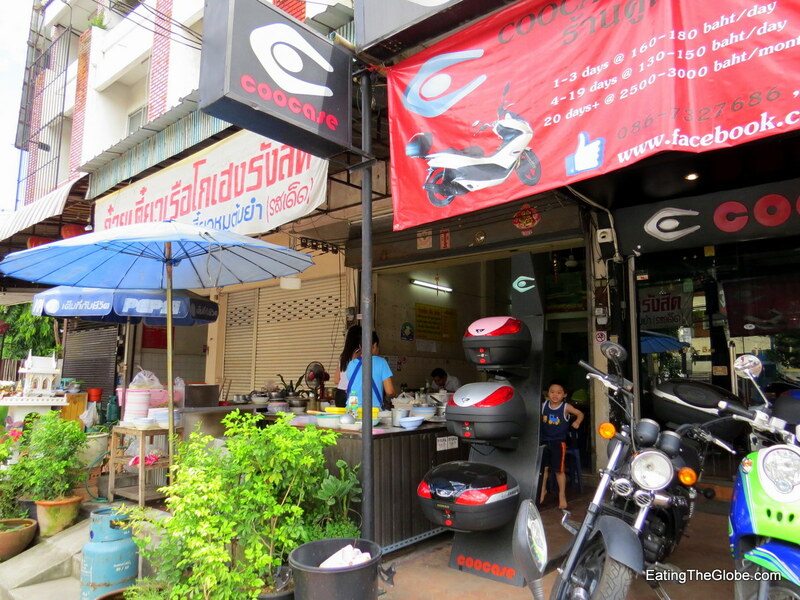 Kuay Tiew Reur Rang Sit Go-Heng is right next to the Coocase Motorbike shop on Huay-Kaew Rd. This is only about two blocks from Nimman Rd. If you are headed down Nimman, you would make a left onto Huay-Kaew and Kuay Tiew Reur Rang Sit Go-Heng would be on your left. They don’t have a sign in English, so look at their sign in the pictures. When you see it, you’re there! 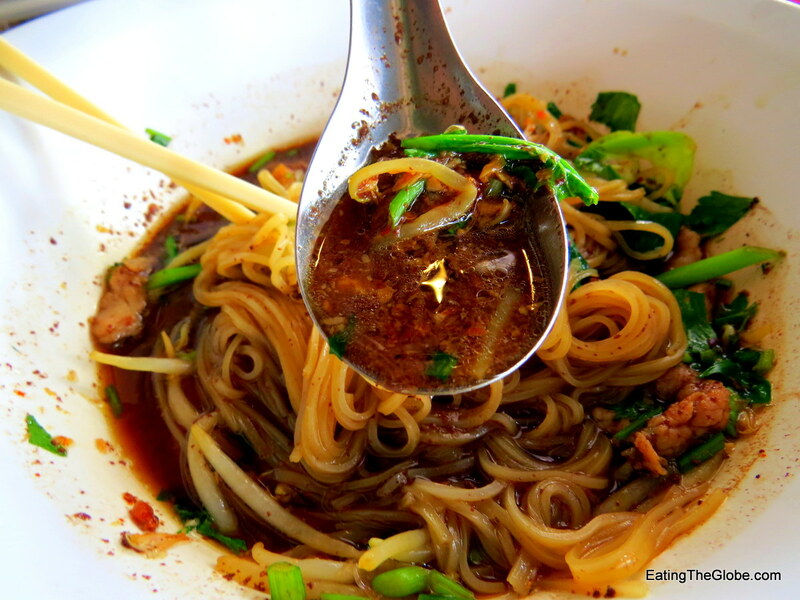 15 Responses to "Where To Go For Boat Noodle Soup In Chiang Mai"
The soups look delicious! If only it were so easy to get something yummy by just saying “one, please” wherever you go, but if you go to a family-run place, you know you will! Thanks for sharing! 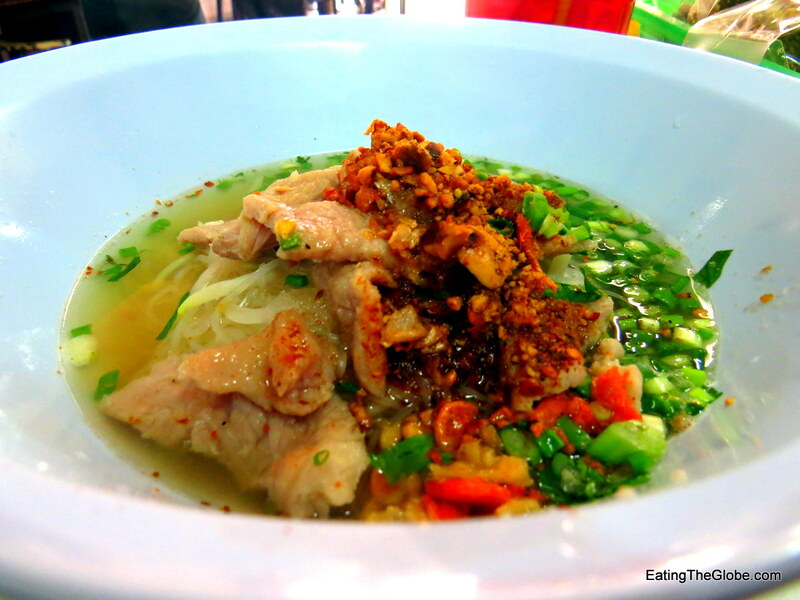 I’ve never had boat noodle soup before, sounds & looks delicious! I love your approach to trying new places, I’ll have to remember the “one please” for when I encounter those menu/photo-less stalls. Great post! Definitely have to try this Valen Dawson. Looks relish! So hungry! I love those chairs and the economy of the ambience in restaurants like this one. All about the quality of food and spice! 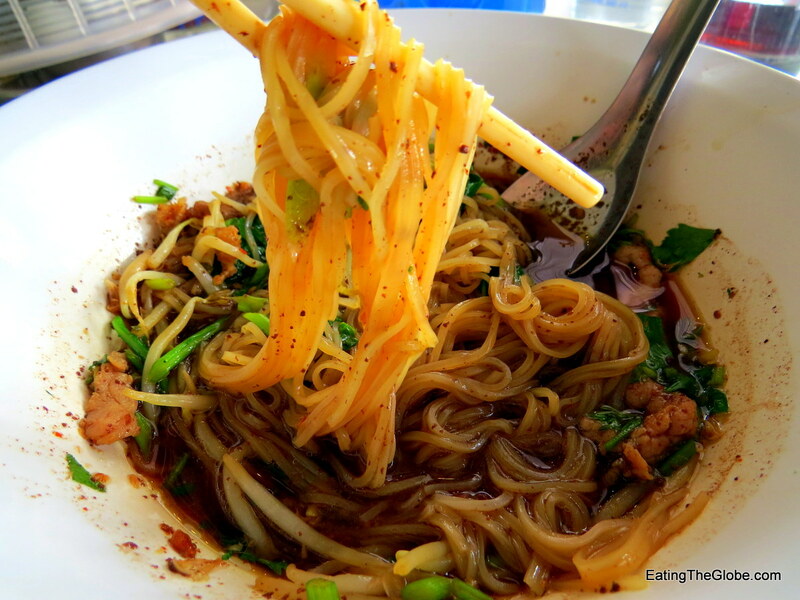 Pye Boat Noodle in Astoria does an authentic version on the east coat. Thanks for the CM rec. Those noodles look really, really good. 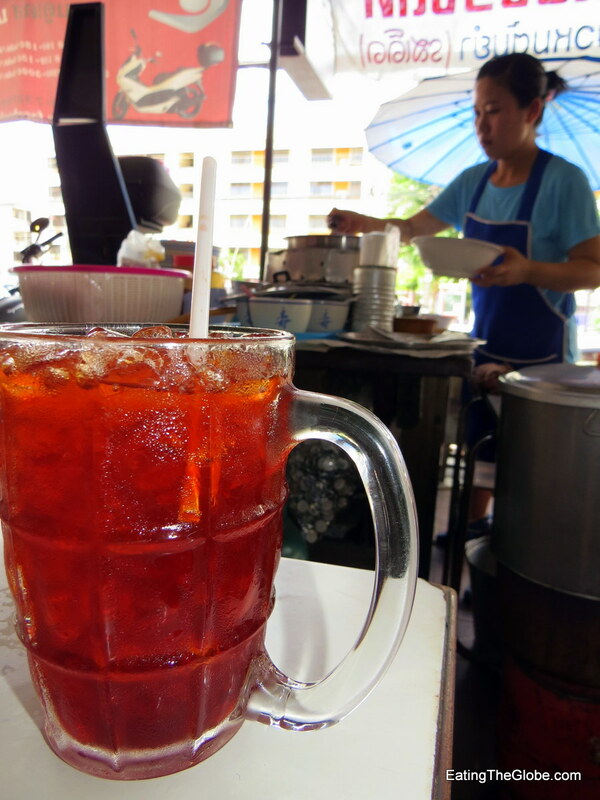 And I did love having a Thai iced tea every chance I got when we traveled in Thailand a few months ago. It is indeed very refreshing. Jennifer recently posted…Drivers…and Jennifer…Start Your Engines! The noodle soup looks fantastic! I’ll be in Chiang Mai later this year and will stop by and try some. Thanks for sharing. Great post, deliciously looking soup :). I remember passing this place on the way from Nimman to the old city, but never bothered to stop. 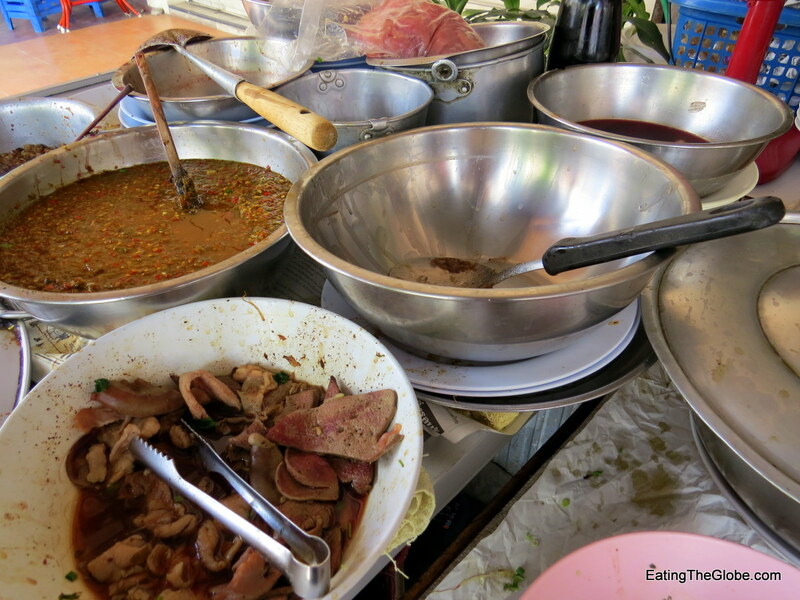 It is always a challenge in Chiang Mai: there are so many places to eat that it would take years to try them all. Sounds and look great. I surprised by how much I liked Chiang Mai towards the end of my stay. the food was one of the reasons. And I’m not that big of a foodie. Thank you so much Ms.Valen. are they open at night too? No, they close around 2 pm. Great tip…just stopped in today after stumbling across your post last night. Aroy! Had a little difficulty finding it, anyone looking to pay a visit just note the signage out front has changed colors to green and white and I think the Coocase has changed names (although it’s still a motorbike store). Excellent little spot and I’ll have to stop again before leaving town! I’m glad you enjoyed it, and thanks for the updated information! !